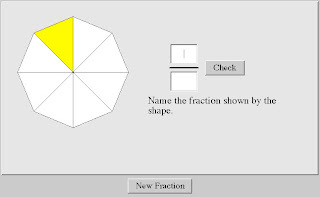 Today, I would like to present a few online practice exercises about fractions for your students. 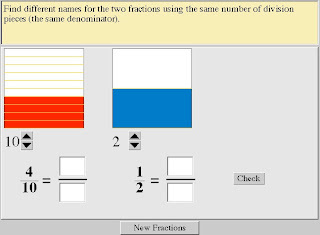 The first one is to help them better understand equivalent fractions. 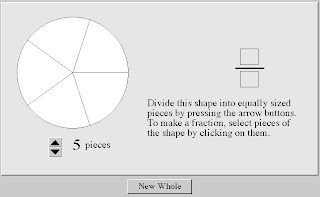 The second one will help them compare fractions. The third one will help them understand that a fraction is a part of a whole. 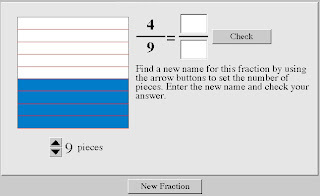 Finally, the last one is a practice at naming fractions. March 19, 2008 at 3:47 p.m.
May 29, 2008 at 12:40 a.m.
Those are great! Thanks for doing this. I appreciate that it's low-pressure (un-timed), yet still engaging. June 1, 2008 at 5:05 p.m.
July 21, 2010 at 3:43 a.m.
October 24, 2011 at 4:14 a.m.